A few months ago, Adelaide ad agency Clemenger BBDO created a snack vending machine that provided free packs of Fantastic Delites to people for pressing a big red button. Sounds simple, right? What if you had to press the button 20 times? How about 100 times or 1000 times? Do jumping jacks or do a robot dance? See more here. 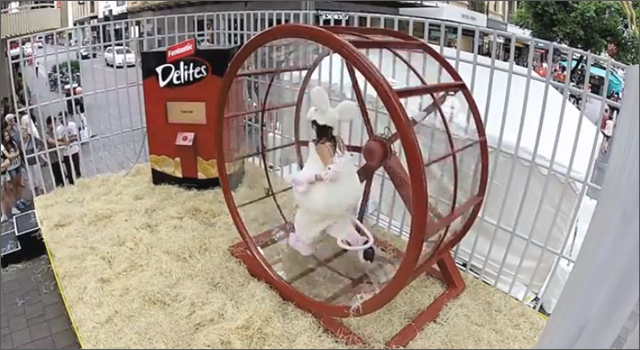 In the latest phase of the campaign, Fantastic Delights and Clemenger BBDO have upped their game with a human-sized mouse wheel and vending machine that gives out Vintage Cheddar (cheese, mice… I get it) and Red Onion flavour snacks. To earn their snack, people are asked to don up lab mouse costumes and must keep up with the pace of the wheel. For the quick-footed mice who reach the highest pace level, they must jump off and press the button before time runs out.